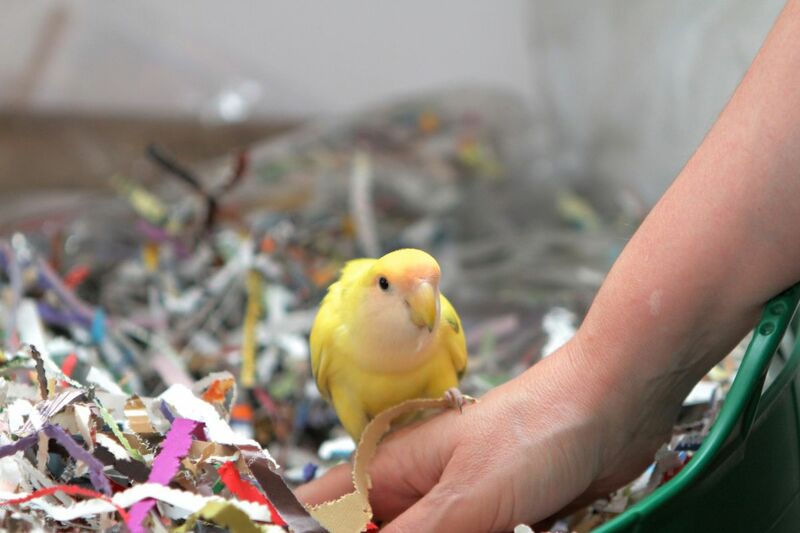 Luigi is a10-year old peach-faced lovebird whose favourite pastime is shredding paper. 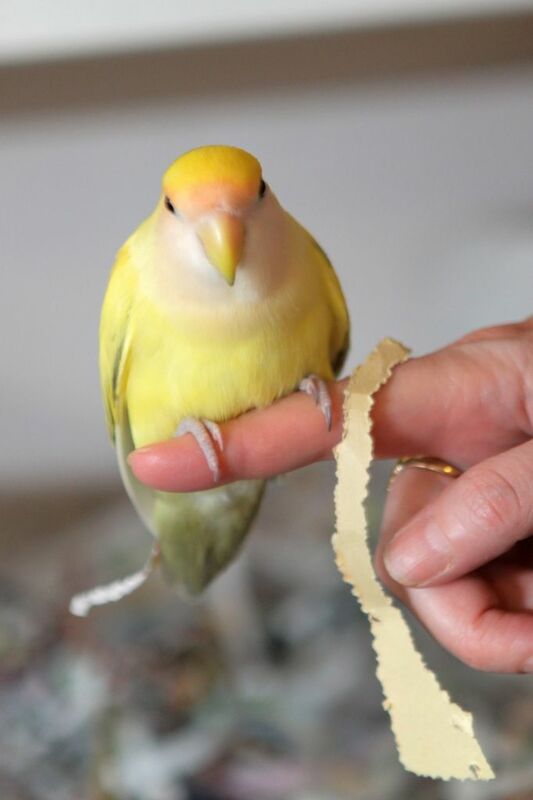 His owner, Mary McQueen, describes him as “an avian artisan” because his beak precisely pierces through paper with sewing machine precision. No doubt, shredding about 4 hours daily results in that kind of perfection. But what to do with all the strips of shredded paper? If you´re Mary, the urge to sit down and fiddle emerges, and eventually a colourful collage is created. And if you have Mary´s creative mind, what began as a simple pastime takes flight to become a money making venture. Mary and Luigi now have their own business called Hand and Beak. Over the past three years the process has been refined so that once a sketch outline has been prepared, it takes Mary about 20 hours to produce the collage using Luigi´s shredded paper. 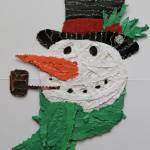 The collages are then professionally photographed to become the front image on greeting cards. Attached inside each card, for authenticity´s sake, is a genuine strip of Luigi shredding. The images have also wound up printed on t-shirts. But the business needed to grow if it was to become self-sustaining and that´s where CBC´s Dragon´s Den comes in. After watching an episode of Shark Tank, where a contestant who drew cat cartoons won $25,000 to expand his business, Mary decided to look into Dragon´s Den, Canada´s version of the franchise. The timing was fortuitous as Dragon´s Den auditions in Victoria were being held the following week. Mary tried out and the next thing she knew she and Luigi were on their way to Toronto to make their pitch to the Dragons. Their appearance on Dragon´s Den was one of the most popular in the show´s history. Mary says, “It was really fun. I felt like I went into a flow state in that environment. I just had no fear at all.” Luigi showed no anxiety during the majority of the taping and was winning over the Dragons. Then a moving camera crane spooked Luigi and he flew up into the rafters above the set. “I knew he didn´t want to get away. Even though he ended up a couple of stories up there in the rafters he was waiting right up above my head. A CBC guy kept a bead on his location.” When it came time for their decision, only David Chilton was willing to provide the $10,000 Mary was seeking. The win came as a surprise to Mary, as all she expected was “to get on TV”. David Chilton subsequently secured a deal for Mary and Luigi´s work with Hallmark Cards Canada in August 2012. The retail launch of a collection of birthday cards coincided with the September airing of Mary and Luigi´s pitch on Dragon´s Den. This was soon followed by a collection of holiday cards, again marketed through Hallmark´s Gold Crown stores. Building upon their Dragon´s Den fame, Luigi became the official spokesbird for Island Document Storage and Shredding in late 2012. He now writes a blog on their website and recently made a brief appearance at the first of their two charity shredding events. Mary continues to expand the business and is working towards the publication of a series of children´s books, all featuring Luigi and his shredding. She will also be producing the collages as stand alone art prints suitable for framing. 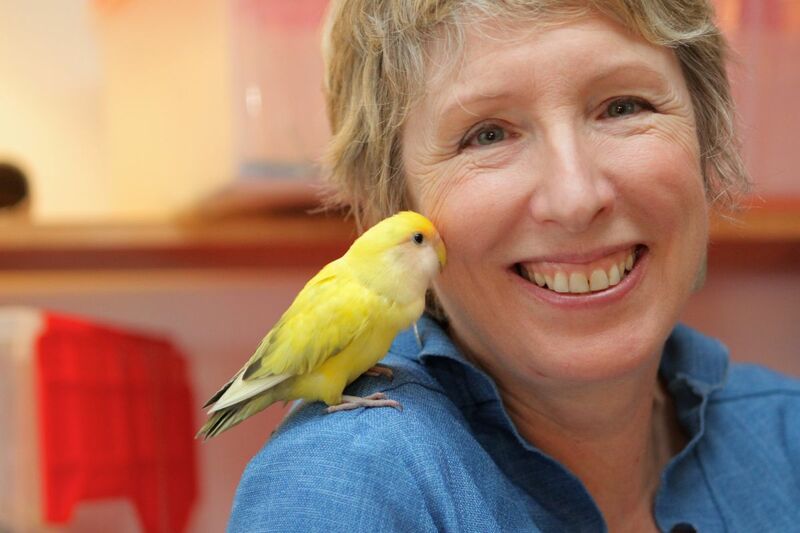 She, along with some of Luigi´s supporters, have formed the Luigi the Lovebird Think Tank to help foster creativity and explore business opportunities. Mary´s humour and enthusiasm are infectious. At home, Luigi spends his day flying freely around the apartment. 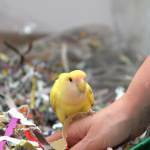 After shredding strips of paper he tucks them in his rump feathers for transport to ´his´ kitchen drawer where he builds a nest. He is always busy, yet at the same time monitoring Mary, with whom he doesn´t like to share. 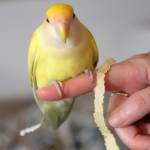 At one point Mary had a fish and another lovebird in an attempt to keep him company but, as Mary says, “He´s very happy to be alone again.” She describes him as “the Dennis the Menace of the bird world. He´s really bossy, gets into everything and he´s non-stop.” His hobbies include throwing things - like pill bottles off the shelf and buttons from a container. So much for those who don´t think birds have personality. The Dragon´s Den producers would like Mary to return to Toronto for a reunion. 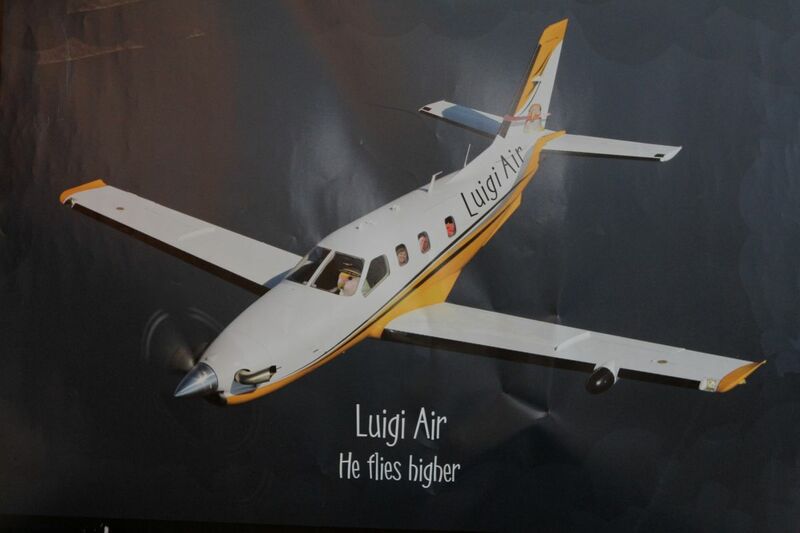 Unfortunately Luigi is no longer allowed to fly on large commercial aircraft. It seems spending hours caged in the cabin during the flight for the original taping was very stressful on Luigi. His veterinarian will allow Luigi to fly again, but only in a plane where he will be allowed to roam freely during the flight. 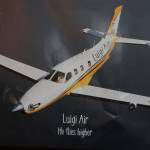 So Mary and Luigi are hoping to hitchhike a ride on a private jet flying to Toronto sometime. In the meantime, Mary´s ever creative mind has developed a Luigi inspired luggage tag for their product line. Mary and Luigi are firm believers in the creative approach to help achieve their goals. As Mary states, “Early days. 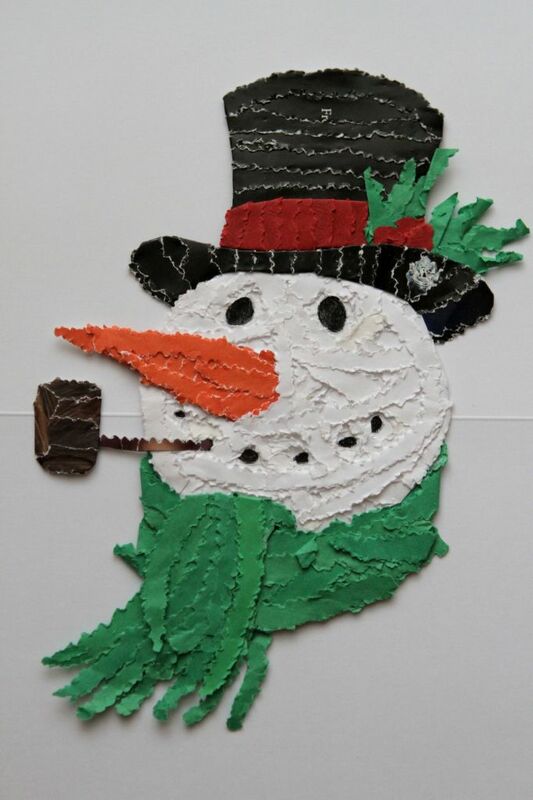 I´m not rich yet, but I´ve had artistic success that I´m very happy with and next comes business success.” In the meantime, Luigi will continue to provide support by doing what he does best, shred paper.